It looks like Saab is headed for the history books. Spyker, the latest tiny auto manufacturer to put in a bid for Saab, has extended its "deadline" until Monday 12/28, but honestly, I don't think they'll be able to pull it off. There have been significant Saabs in my life. My friend Ronnie had an old 2 cycle Saab 96. We called it the "Circus Car" as every body panel was a different color. Ronnie drove into things a lot. My friend Regina took me to the hospital in her new 1981 Saab 900 when I got food poisoning. I threw up in it. We remained friends. Forgiving someone for barfing in your new Saab is a true sign of friendship. My friend Dave had a Saab 99. We put a new exhaust in it one afternoon. About 30 seconds after we tightened the last bolts and rolled out from underneath it, it slipped off the jack stands. We looked at each other, realized how close we had just come to being killed, went back to my apartment and did a couple of shots of Bacardi. It seemed like the appropriate thing to do. 2 good friends and my attorney still own Saabs. My attorney's Saab is a 9000 with just over 200,000 miles on it. We argue about whose car will die first; his Saab or my 200K+ BMW. I bought a Saab 9000 in the mid 1990s. I liked it. It was comfortable, reasonably quick, and reliable. It wasn't very exciting, though. I should have opted for the turbo version. In 1997 I traded it towards the 1995 BMW that I still have today. When the time comes to replace the BMW, a Saab Turbo is on the short list of cars I'll look at. I decided today to write about a few Saab convertibles. I spotted a couple of ads the other day for "classic" (pre-1994) Saab convertibles being offered at astronomical prices. $12,000.00 and up. In some quarters there seems to be the misconception that the demise of Saab automatically makes these cars collectors items. They're not and won't be for many, many years. 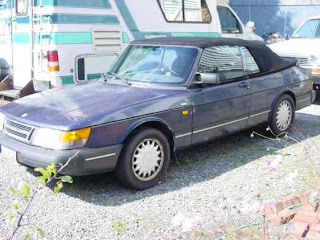 1989 Saab 900 Convertible Turbo - This is an expensive old Saab convertible. It's most likely worth the money. It's a fully loaded turbo with under 70,000 miles on it. It appears to be a well maintained, completely stock, car. It's big downside is the automatic transmission. In my opinion, it takes away some of the fun of the turbo engine. Also, older Saabs had trouble prone automatics. Saab was aware of this and often replaced the transmission after the cars were out of warranty. Some maintenance history would be a good thing to have with this car, as the selling price, $5,995.00, is top dollar. Located in Springdale, AR, find the AutoTrader.com ad here. 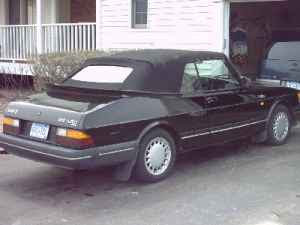 1992 Saab 900 Convertible S - Here's the other end of the spectrum. This is a non-turbo 190,000 mile car. The transmission was replaced 25,000 miles ago. It has a new exhaust system. The seller says that he has done all the routine maintenance and changed the oil every 3,000 miles. The car has a few flaws. The A/C doesn't work and the lights on the stock Saab cassette deck are out. (Who cares? You'd probably want to upgrade it to a CD player anyway.) The front seats could use some covers or repair. More significantly, there is "a few surface rust spots on driver's door" and some "rust around passenger directional side light". With an asking price of just $1200.00, you could spend a little money having that repaired or just have fun driving the car as is. Located in Manchester, MA, click here to see the AutoTrader.com ad. 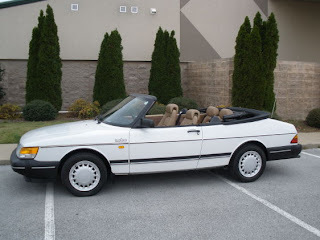 1989 Saab 900 Turbo Convertible - If I were in the market today for a classic Saab convertible, this would be the car I'd take a serious look at. This is a 103,000 mile Turbo with a 5 speed. The seller states that he "bought this car as a cosmetically beautiful but mechanically challenged vehicle". He "replaced the crank pulley, front seal, oil seal, starter, radiator and blow off valve. It also has a fresh 5 speed transmission and clutch with about 3,000 miles on them". He says it's rust free and in "pristine" condition. If the car is everything the seller says it is, the asking price of $2800.00 is very reasonable. Located in Shakopee, MN, click here to see the Craigslist listing for this car. I'm writing this post late Sunday evening. Who knows? Maybe tomorrow Spyker and GM will come up with some sort of deal. I doubt it, though. GM's recent track record of failing to sell off their unwanted brands isn't a good sign. The deal for Saturn fell through. The deal for Opel was rescinded and GM is hanging on to the brand. (I don't believe GM wanted to sell Opel in the first place. I think the whole "sale" of Opel was a ruse to make the US and German governments think GM was trying to raise cash on its own and not relying solely on loans.) A good number of Swedes have accused GM of not trying hard enough to sell Saab. They claim GM wants to kill off Saab, rather than face it as a competitor in the future. I don't know that I believe that, but it's not the most far-fetched idea I have ever heard. Not much surprises me these days. I hope Saab survives. Even under GM's ownership, Saab remained an alternative to the cookie-cutter cars coming out of Europe, Asia and America. But, in the likely event that Saab doesn't survive, there are still plenty of used Saabs available. Those of us who like our cars to have personality shouldn't have too much of a problem finding one for quite awhile. I grew up in a succession of Saabs - a '75 99 LE, an '86 9000 turbo, and a '93 9000CSE turbo. You definitely want the turbo, the '93 has full torque from 1900rpm, and the '86 was explosive at about 3000rpm. Either way was fun for someone who was just learning to drive. My parents still have the '93, and even though it's showing its age a bit, it's still a blast for such a big car.